Sindiso Ndema Ngwenya, is a Zimbabwean economist and transportation expert. He is the current Secretary General of the Common Market for Eastern and Southern Africa (COMESA). Prior to that, he served as the Assistant Secretary General of COMESA in charge of Programmes, from 1998 until 2008. He holds the degree of Bachelor of Arts in Economics and Geography. He also holds the degree of Master of Science in Transportation and Traffic Planning. 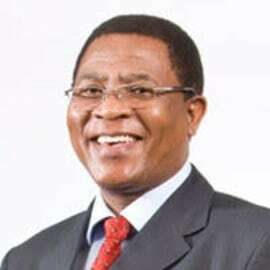 Sindiso Ngwenya serves as the Chairman, Board of Governors, Food, Agriculture and Natural Resources Policy Analysis Network (FANRPAN), a policy analysis and policy dialogue forum, promoting and supporting an Africa that is free from hunger and poverty. He also serves as the Vice Chairperson of the African Trade Insurance Agency (ATI) Board of Directors.